This smaller rectangular baking pan, would be a welcome addition to any kitchen and a great gift. Perfect size for smaller casseroles or your favorite cornbread. The thick stoneware promotes an even temperature during baking and maintains heat as you serve. The smooth glaze has been high-fired and is simple to care for - just soak for a few minutes and your pan will clean up easily. We have 3 sizes - get all three! The exquisitely detailed Dearest Friend pattern is hand-painted in Poland following a 750-year tradition of artistry. 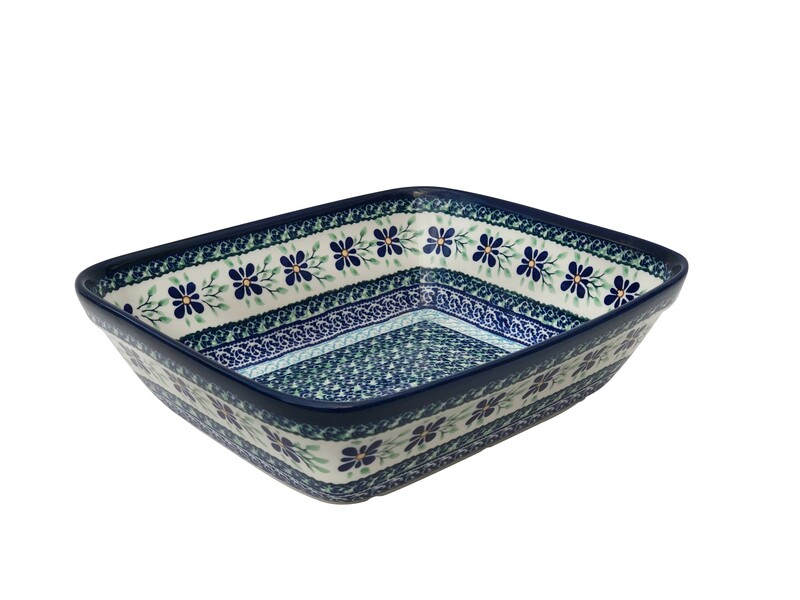 Made by a skilled artisan striving to get into the master’s league, the complex modern design and use of colors of this Polish pottery add a warm, welcoming mood to your table. Inspired by the colors of peacock feathers, a complex pattern featuring cobalt blue flowers with tangerine orange center is surrounded by a host of green leaves on a rich creamy base, which is further framed by intricate patterns in shades of green and blue. "1350/DU121 DEAREST FRIEND BAKER"